What are Clipless Pedals, and Why Would I Want Them? Prior to clipless pedals, riders looking for a more efficient pedal stroke used basket-like toe clips and straps. 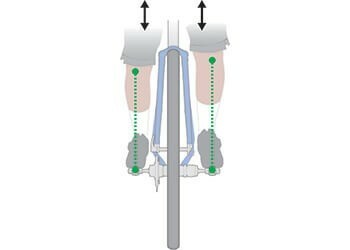 They came from the belief that having your feet REALLY connected to the pedal would provide the ability to gain power from pulling up almost as much as you push down. But for the system to work you needed to have the straps tight. Scary, if not terrifying, when you had to stop quickly. The term “clipless” just refers to the absence of clips and straps, even though you’re still technically “clipped in” to a clipless pedal. Just one of those things it’s best not to think too much about. The introduction of clipless pedals preserved all the benefits of toe clips and straps without the danger. Step in, and feel confident to safely ride harder. A simple twist outwards away from the bike, and you’re free. It takes some trial and error to get into a clipless pedal without having to look down, but it’ll probably take less time than you think when you’re futzing around getting started. Despite the petite size of the interface and in most cases, the pedal body itself, clipless compatible shoes have a stiffer sole which all but removes the pressure point you might expect. And modern cleats can have varied degrees of “float” before you disengage so you can still rotate joints a little for relief if they need it. iSSi pedals offer different spindle lengths to accommodate diverse body dimensions and their subsequent kinematics. For more information on spindle length and why it’s important, click here. Going clipless requires a bit of an investment if you’re going to purchase shoes at the same time. However, clipless pedals like the iSSi Flip feature a clip on one side and a flat platform on the other if you want to keep the option open for riding in casual shoes. Even entry-level clipless pedals will likely feel much nicer than pedals that come stock on many bike builds. Like most things, as the price goes up, the return on investment may be much greater: Well -protected bearings mated to perfectly machined tolerances around incredibly durable materials make a good pedal design outstanding to ride on. Clipless pedals and their cleats are designed to work together. While some manufacturers share cleat designs that are cross compatible, some utilize very specific cleats that can become jammed and even locked into the wrong pedal – a situation you don’t want to find yourself in! 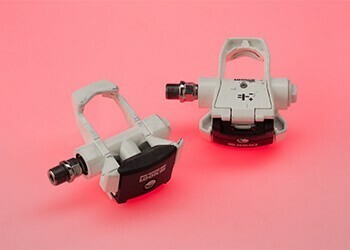 iSSi offers cleats that are Shimano SPD compatible and Look Keo compatible. Always make sure you are using the right cleats with your pedals.